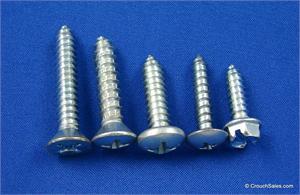 Sheet metal screws also known as Self Tapping Screws. Sheet metal screws zinc plated are threaded from the head down to a sharp point on the end and are usually used with a pre-drilled hole. Sheet metal screws or tapping screws are available in phillips and slotted drive and in several head styles including flat head sheet metal tapping screws, hex head sheet metal tapping screws, oval head sheet metal tapping screws, pan head sheet metal tapping screws and truss head sheet metal tapping screws. Flat Head sheet metal screws a/k/a flat head tapping screws are self tapping sheet metal screws with a sharp point and threaded to the head commonly used in metal with a pre-drilled hole and available in #4 thru #14 diameters and 1/4" thru 3" lengths. Oval Head sheet metal screws a/k/a oval head tapping screws are self tapping sheet metal screws with a sharp point and threaded to the head commonly used in metal with a pre-drilled hole and available in #4 thru #14 diameters and 1/4" thru 3" lengths.